The Nut-Free Mom Blog: Peanut Allergy Friendly Nut-Free Irish Soda Bread: 2 Recipes! 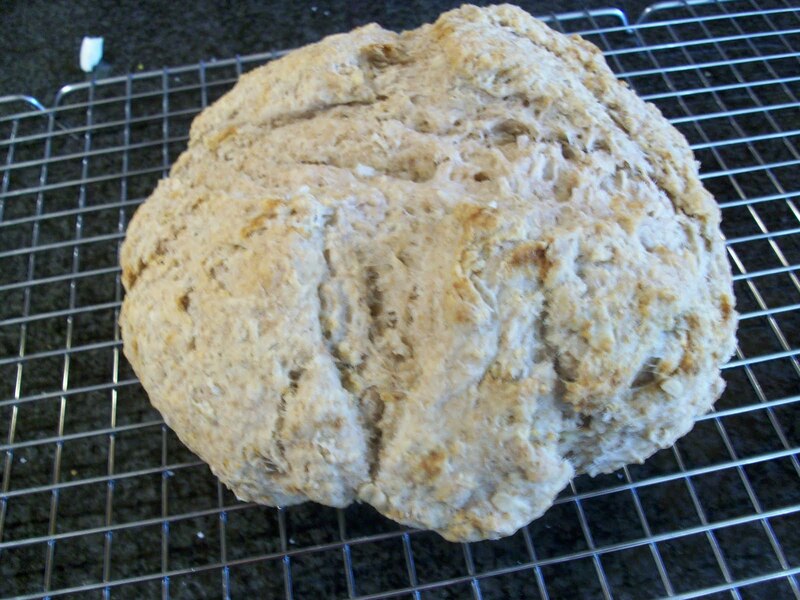 Peanut Allergy Friendly Nut-Free Irish Soda Bread: 2 Recipes! 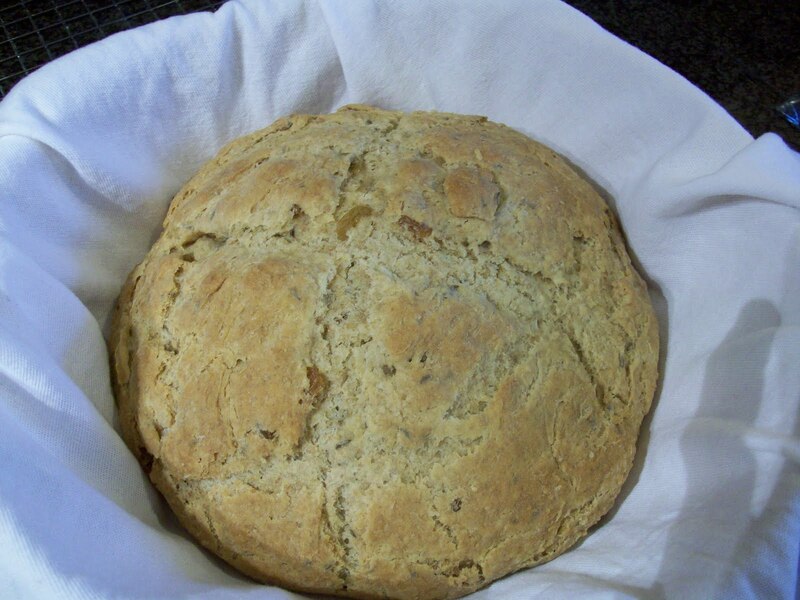 As a person of part Irish descent, I feel it is my duty to serve soda bread on St. Patrick's Day. Since bakery goods are off-limits to the nut-allergic, I've had to make my own for several years. Luckily, I prefer the homemade version. That's how it's meant to be! I make the two recipes below with some regularity and I couldn't decide which recipe to share, because even though they both breads pictured above look like rustic Irish soda bread loaves, the taste is so different. One is like a sweeter tea bread (the second loaf pictured) and the other is like rich biscuit. My kids prefer the more basic loaf, while my husband and I enjoy both kinds. Of course, Irish soda bread does not contain nuts, but if you buy from most bakeries, any bread baked will have cross-contact risk for nuts. Did you know that a true Irish soda bread will contain these basic ingredients: flour, buttermilk, salt, baking soda. I heard about this on NPR yesterday: some guys from the Society for the Preservation of Irish Soda Bread were talking about it. How cool that there are people this devoted to soda bread? I'm not the only baking geek out there. However, my loaves add a little baking powder for better rising without an overpowering baking soda taste. I hope you enjoy these recipes, not only on St. Patrick's Day, but all year long! These breads are quick to make and a delicious accompaniment to soups, stews, salads and more. 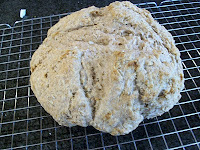 Irish soda breads are best the day they are made but are also good toasted the next day. Place oven rack in middle of oven and preheat to 375 degrees F. Spray a large baking sheet with Pam w/flour or grease and lightly flour the sheet. Mix together flour, baking soda, baking powder and salt in bowl. Stir in sugar, caraway, raisins. Add buttermilk and mix until just moistened, but still a little lumpy. Do not over mix in the bowl. Place dough on floured surface and knead a few times, then divide dough into two parts. Shape each piece of dough into a ball and pat out until slightly flattened but still domed. Place dough on sheet at least four inches apart. Cut a large X-shape into the top of dough with a sharp knife and brush with melted butter. Bake 35 to 40 minutes, until bottom of loaves sound hollow when tapped. Let cool for 2 hours before slicing. Preheat oven to 350 degrees F. In a large bowl, mix flours, baking soda, salt, baking powder and rolled oats. Stir buttermilk into flour mixture until moistened. On a floured surface, knead dough a few times. Form dough into a ball and then proceed as for above, making X with knife and brushing with butter. Bake until golden brown 35-40 minutes and bottom of loaf sounds hollow when tapped. Let cool for 1 hour on rack before serving. Oooh, I'm SO going to make the one with raisins. I'll keep a loaf for myself, and take one to my parents or grandparents. It will go great with the corner beef and cabbage I'm making. Thanks for posting these recipes! Thank you for these great receipes. My child loved it!